To contact Ted at “Muddy Bucket Farm”, email him at tedmaiden@aol.com . 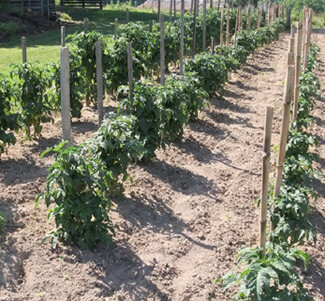 To browse all varieties offered by Muddy Bucket Farm, please click here. Welcome to The Muddy Bucket Farm. We are located about 35 miles north of Knoxville, Tennessee at the eastern edge of the Cumberland Plateau. Our goal is to offer a wide selection of tomato seeds ranging from Old Heirlooms dating back into the 19th century to recent releases of newly developed varieties. I acquire seeds from all over the world – six of the seven continents. After testing them in my garden, the ones that pass the “good taste” test will be offered.